عندما تزور Luganville, ستشعر أنك في بيتك في Turtle Bay Lodge الذي يقدم لك إقامة متميزة و خدمات عظيمة. يمكن من هنا للضيوف الاستمتاع بسهولة الوصول إلى كل ما تقدمه هذه المدينة النابضة بالحياة. يضفي محيط الفندق اللطيف وقربه من ‪Mount Hope Waterfall‬, ثقب ناندا الأزرق / ثقب جاكيز الأزرق سحراً خاصاً على هذا الفندق. إن الخدمات التي يقدمها Turtle Bay Lodge تضمن للنزلاء إقامة مريحة. يقدم الفندق واي فاي في المناطق العامة, خدمة الغرف, التوصيل من وإلى المطار, رعاية أطفال, تأجير سيارات لضمان الراحة القصوى لضيوفه. يمكن للنزلاء الاختيار من ضمن مجموعة من الغرف المصممة بعناية لتعكس جواً من الراحة، والتي يتجاوز عددها 10. يمكنك طلب اللائحة الكاملة للخدمات في الفندق ومن بينها كنو, شاطئ خاص, حمام سباحة خارجي, صيد السمك, تدليك. 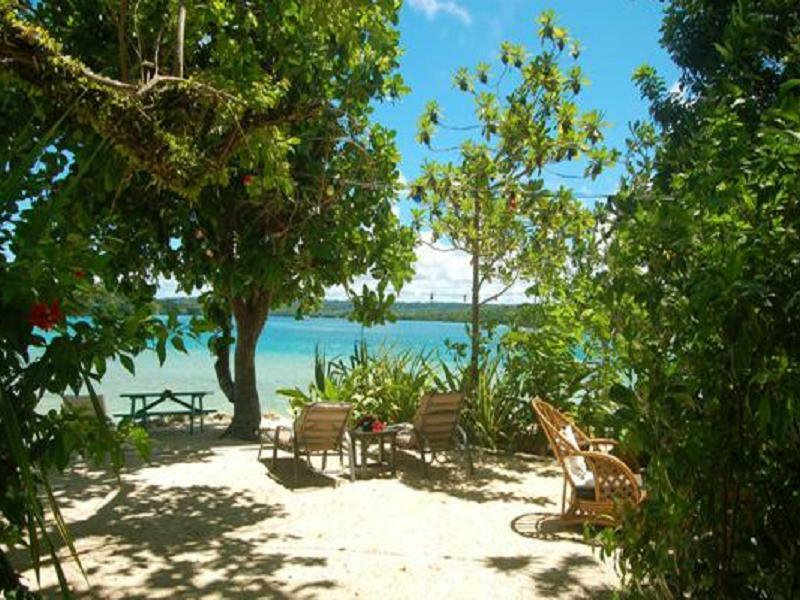 إن Turtle Bay Lodge هو خيار ذكي بالنسبة للمسافرين إلى Luganville، بما يوفره من إقامة هادئة ومرحة. We loved our stay there! It’s in a good location on the island and the resort it really pretty. You can see the ocean from your bedroom window and hear the sound of waves at night. Food was great and staff were really friendly. I would recommend hiring a car for your stay though as there’s nothing around the resort and you will need it to get to other attractions on the island. Great location if you want to be close to the blue holes. All was good . Perfect location , helpful staff, wonderful view , tasty food and very friendly owners . worth the price . Staff is a big slow (island time) but very friendly. Lovely location, very friendly staff: Skye and Diane were really amazing, they were really helpful and accommodating when it comes to getting our days organised. The thing we loved the most was getting around with the kayak and visiting magic places such as blue holes and remote islands. Expensive food and expensive stay. It seems everything in Santo is costly. Dorm room is ok- 1 bunk bed, 1 single, and 1 double sharing bathroom and toilet. Affordable in one sense but food here is expensive. Beach is very disappointed; coral and rocks; not much sand. I think the good thing is that you can kayak to one of the blue hole; and another Riri blue hold which is way further which I did. I got lost finding the first one and end up going to Riri and it took me almost 6hrs kayaking w/ short breaks/ swimming/ etc. I was fit so I thought it was a really nice experience. The other day I went to Millennium Cave and they provided me lunch box at 1000vt. It ended up having 3 pcs of bread; a can of tuna, slices veggies, cheese, olives, and some crackers. Very disappointed. 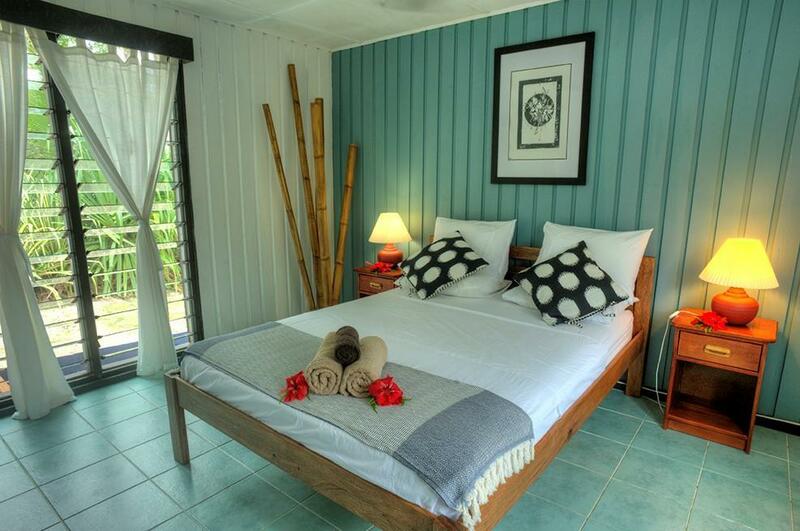 If money is not an issue- go stay at Oyster Island Resort. Bigger/ Better/ More Amenities. They have sandy beach and closer to both the blue holes. Not sure if I ever come back to this country since this is way expensive and I'm from Thailand, so i will be better off hop on a 1hr flight down south to our local islands. Very disappointed the pool was empty as it was 30 degree weather and we had looked forward to a dip after a long day of travel. , surprised they charge for Internet and unkempt Kayak use , first time we encountered fees for such services. our room next to the kitchen was not quiet. I would stay elsewhere if I returned. Very relaxing. a good place to do nothing. 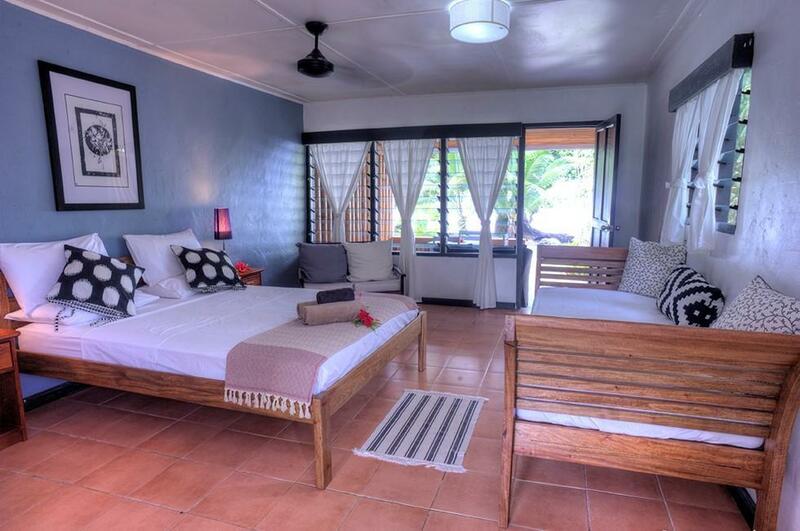 Lovely place to stay with beautiful outlook and close to beautiful blue holes for swimming. Out of town but worth the drive, recommend hiring a car. The owners were really good and helpfull, the staff and food do a credit to Emma & Trent, you could not ge far wrong in choosing this venue. The diving was Great! Although a little way out of town it was a great place. Good food, Great people & the diving really good. 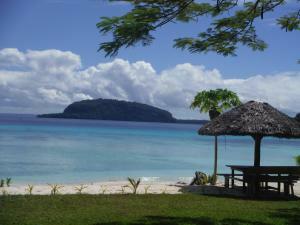 It has a nice sheltered lagoon and some interesting reef out front with good fish & marine life. Well worth a stay. It was a nice relaxed stay unfortunately with too much rain. Santo itself is quiet pricy. You can even hitchhike the 20km to Luganville. Nice people around. Nice staff. 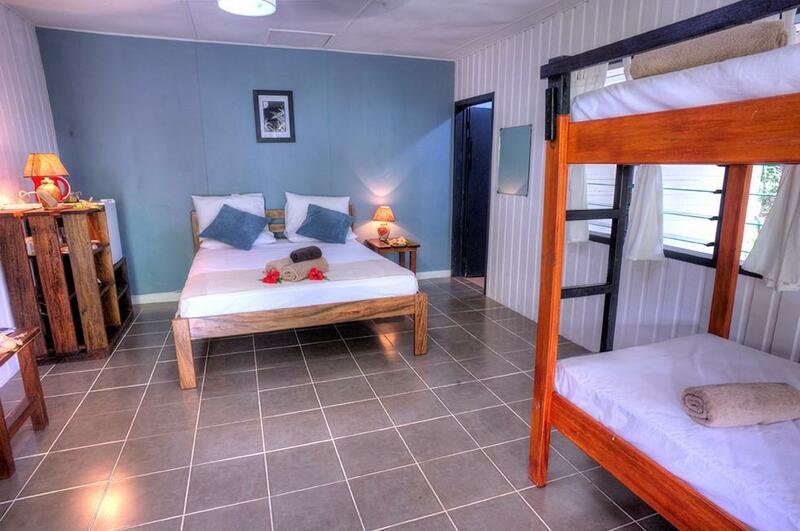 Quiet but can go canoeing to nearby waterhole (Big Blue - a must see) or snorkelling at the front of the location. 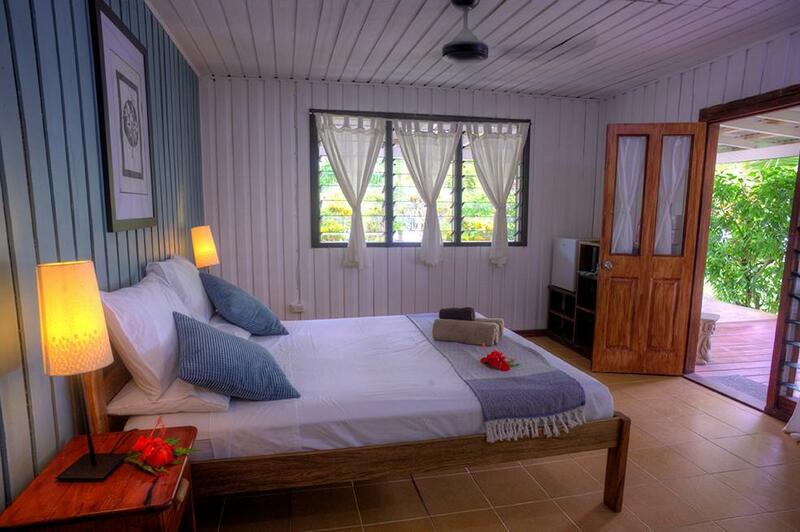 The bungalow rooms are modest but well presented. Food was good and staff were lovely. Hôtel et personnel agréable avec massages possibles mais si on réserve à l'avance,une petite piscine mais qui devient verdâtre dès l'après-midi.La situation à 30km de la ville rend un peu captif de l'hôtel et du restaurant.De nombreuses activités peuvent être proposées.